Last night I had a chance to sit down for 15 minutes of Diablo III multiplayer arena battles. Forty-five minutes later I finally made good on my "just one more round" promise. The wait for this game just got harder. It's such a simple concept. Three players on each team enter a relatively simple little arena and battle it out until only one team is left standing. In any other game this would be a silly little diversion, but the scope of character customization in Diablo III makes for a multiplayer experience that might never get old. The massive demo area was swamped with players, and even the special press access line was a lengthy one. I stood in line for a good 15 minutes before getting into a group, which is nothing compared to the hours the Blizzard fans in the other line had to wait. It still felt like an excruciatingly long time. When I finally got my seat I was presented with a simple character selection screen. Only the Wizard, Witch Doctor, and Barbarian were selectable, leaving my dreams of double crossbow Demon Hunter kills in the dust. I chose Barbarian. My teammates chose wizards. The opposing team consisted of a Witch Doctor, a Wizard, and a Barbarian. I quickly learned you do not bring a Barbarian to a Wizard fight. The action was fast and frantic. While I was still getting used to moving without activating the Barbarian's Whirlwind attack, I was quickly taken down by the combined forces of the Wizard's Disintegrate, the Witch Doctor's bouncing fire attack, and the opposing Barbarian's Whirlwind. Dying puts you in ghost form, where you can still freely wander the map, shouting out instructions to your teammates. Wizards' Slow Time bubbles were everywhere. Slow Time plus the stationary turret hydras seemed a popular combination. The first few rounds went rather quickly, but soon all of the players were getting the hang of the arena. Injured players figured out where the health globes would spawn, causing a mad rush to the middle of the map at certain points in each round. Uninjured players would try to get the globes first, denying their enemy of valuable health points. After seven rounds I dropped out and returned as a Wizard. Soon our team had three Wizards, bringing the full force of triple Disintegrate beams on our foes. They responded in kind, and soon the classes swapped again. The Witch Doctor's bouncing fireballs were ridiculously fun to use, as wear the classes various travel powers, making chases more intense and entertaining. At some point the demo timer ended. We kept playing, ignoring the "Thanks for Playing" sign that continuously flashed on the screen. When I finally left, our team was ahead 10 games to seven. Later I was told that after I left things fell apart, but I walked away a winner. All in all it was an incredibly entertaining session, and it can only get better. We were playing with premade characters. When the game is released, players will be bringing their own custom built characters into the ring. Characters they've played in single player. Characters they've modified with a unique combination of power-modifying runes, stat boosting traits, and protective armor and weapons. The combinations are nearly endless. One Wizard you face will have completely different powers and tactics than the next. Sure, ultra powerful builds will surface, but those only serve as targets for other players to top. 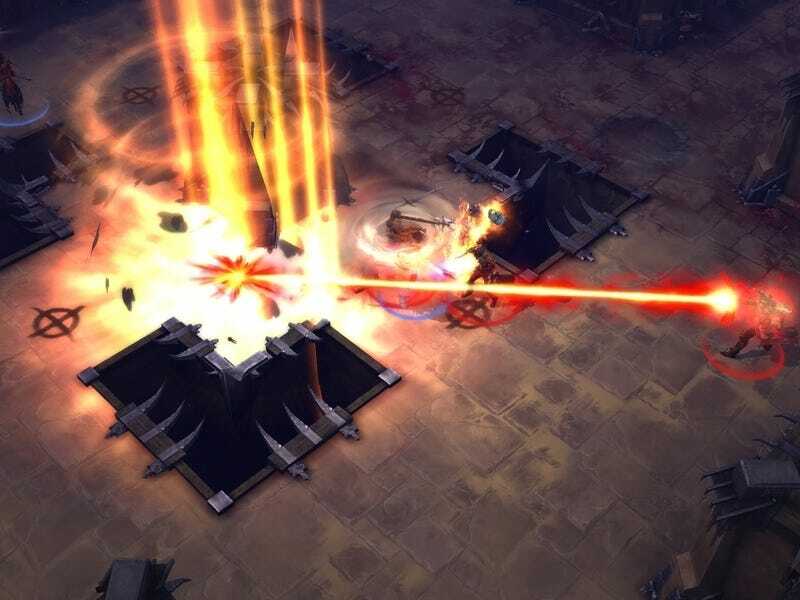 The competition will spill outside of the arena and into the single-player game, with one eye always on how the next upgrade or skill will affect arena performance. The potential is staggering, and a long, painful wait for Diablo III to hit stores just got even more agonizing.